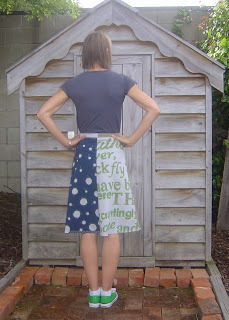 When one has no Alabama Chanin project lined up after the one on which one is currently working, one tends to panic slightly, which actually lends itself to a bit of creative thinking, which led to this skirt. I figured I could make this skirt (the skirt pattern is from the Alabama Stitch Book) from scraps left over from other projects, stencils created for other projects (except the rose one, which is for my next project), one paint colour, and thread also left over from other projects. 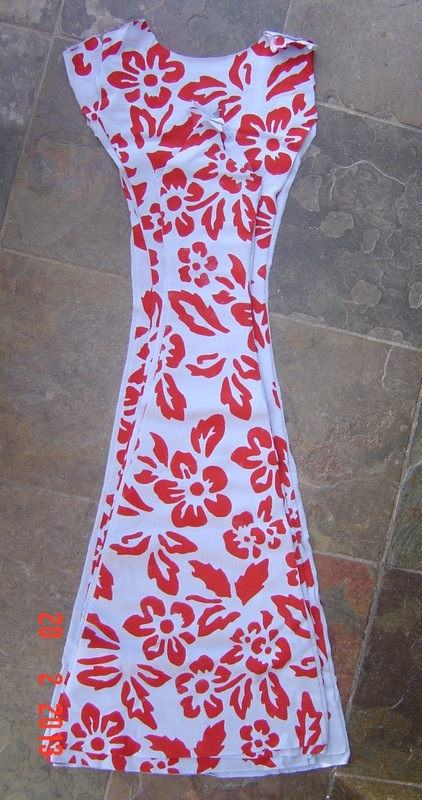 Sort of a free skirt. 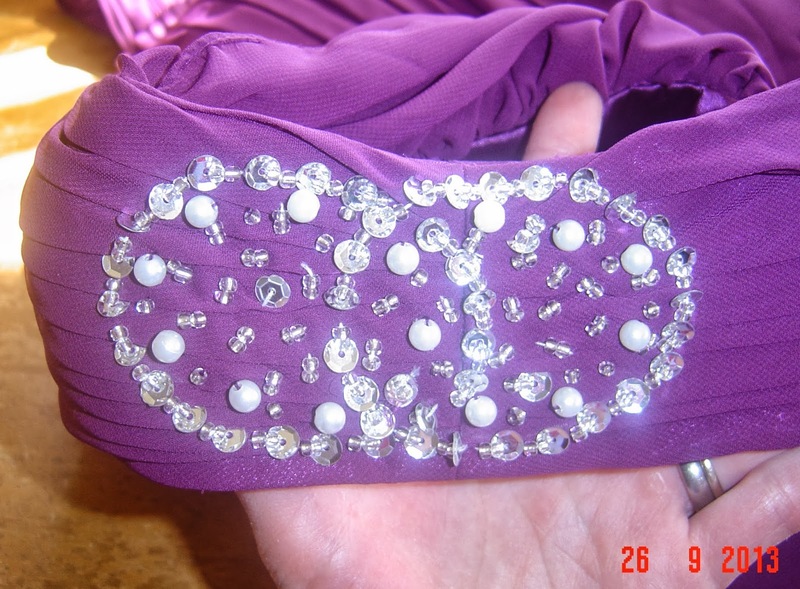 It was Georgia's idea to make the waistband (I prefer a waistband with elastic in it to foldover elastic at the waist) from sections which matched the under layer of each panel. She shows great creative promise, that girl! I love the shape of it, so there will be more of these in my future! 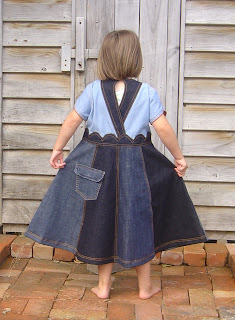 I'm up to a dozen Alabama Chanin garments now, with no easing up on the love of making and wearing them! Meanwhile my poor Nougat has been languishing as I suddenly got busy with sewing for other people, general busyness, and most excitingly, a new JOB! I am now working part time in a store which sells NZ made merino clothes. 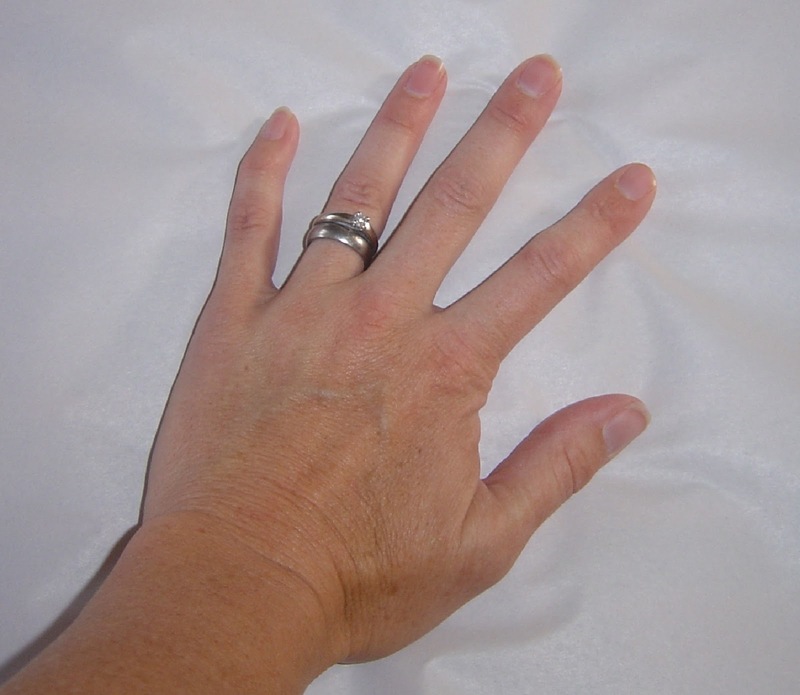 So I get to spend my work time fondling lovely merino, and of course I have to wear it too. I really really really love that! At least when I do eventually finish my Nougat it will look lovely with my new merino cardy and shrug! Oh, and I had a really hilarious 15 minutes of fame last week when I got press ganged into dressing up as though I were going to the races to illustrate a story for the paper on Melbourne Cup day. I was on the front page. My name was printed. And not even my parents recognised me! Best comment was from Georgia, who showed the paper to her friends at school, and they didn't believe it was me. When I asked why, she said "Because they've met you". Um, yeah, I don't look like this EVER. Excuse the cheesy title - couldn't resist. Anyway, I started salivating over the Nougat pattern as soon as I saw it. 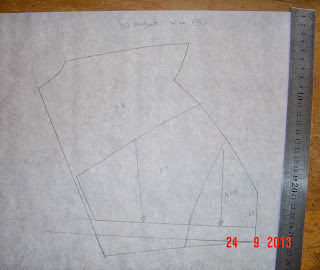 I seldom get excited over patterns produced by hobbyists because they are usually pitched way below my skill level and interest, and so frequently something I could draft myself very easily. 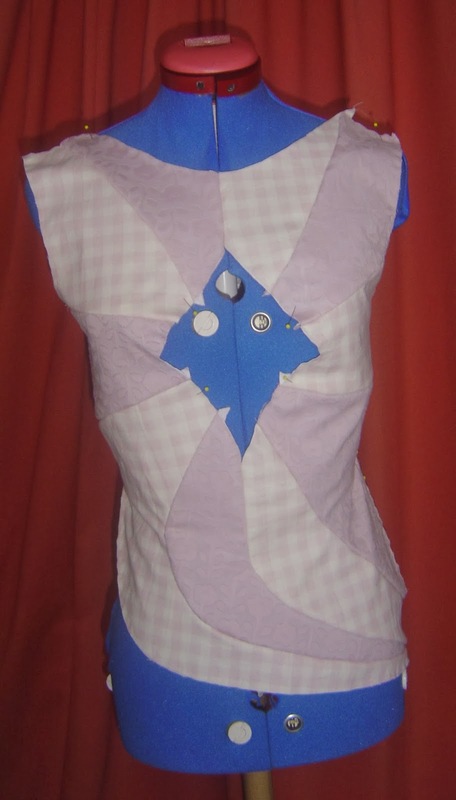 AnaJan may not be a "professional" patternmaker, but she is trained, and boy did she produce a cracker! Enter the frustrations! Firstly I had to wait a day to get the pattern because after you purchase on Etsy AnaJan sends you an invoice, you pay it, then she makes the pattern available to download. She warns that this can take up to a couple of days, and given her location in Serbia and mine in New Zealand, I expected a delay. In fact from purchase to download was less than 24 hours, which I thought was pretty good! (I have no complaints about the purchase process, I'm just totally crap at waiting for anything). That was Monday. I had the pattern first thing Tuesday. Since my home printer is running low on ink and the pattern is 60 pages I figured I'd pop along to Warehouse Stationery and print it there. At which point Isabella threw up. And the poor thing had a not-very-violent, but very dragged out tummy bug. She was off school for the rest of the week, at which point Nicholas got it, and was off for most of the following week. Since you can't take sick kids anywhere, that meant I had to wait till the weekend to get out and print! You know that bit where they tell you to print out the test square first? Yeah, you should totally do that! 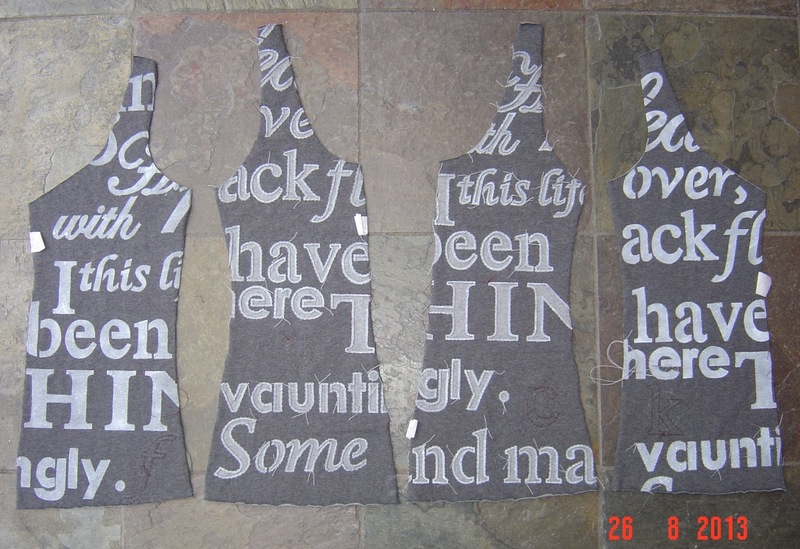 I didn't, and when I finally got time to check the pattern I realised it hadn't printed to scale! I wondered how far off it would be if I just went down a size, and with nothing to lose I gave that a shot. This is a size 34 printed slightly larger than it should have. (The 10cm square came out more like 11cm) It isn't terrible, and I toyed with the idea of just working with this and making it work. 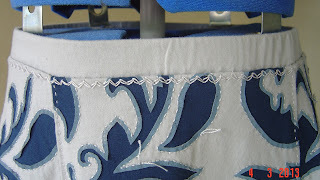 Just a note, there are no seam allowances on the neckline, armhole or waistline edges. 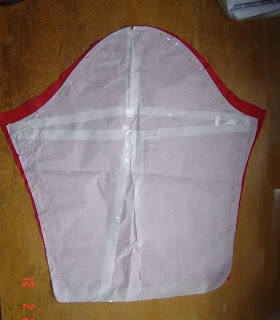 I find with a fitting toile that it is easier to visualise the finished garment if you have the finished dimensions. So, all the kids are over their bugs and back at school, giving me time and space to get started. 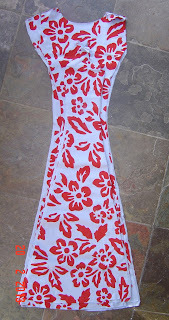 I'm very happy with the fit of my second toile, so I'm going to go ahead and work from that. I may lower the waistline a little bit, but everything else is fine. I spoke too soon. Literally just as I finished typing the above the phone rang. Oliver has been vomiting at school. 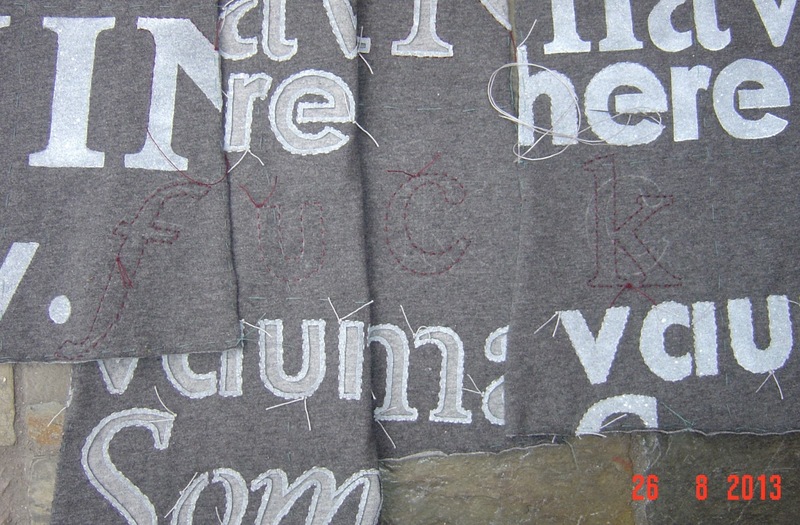 Not that you can see it of course, which is the point, but here is my Alabama Chanin poetry tank, with added f-word. I love the fit, the colours, everything about this. 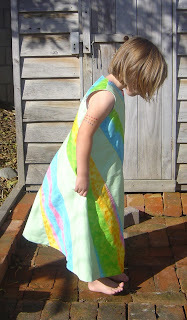 I'm keen to have a crack at making the dress version of this pattern. I can't see myself ever getting bored with this technique. The possibilities are endless! Oh, and Georgia bids me tell everyone that I nicked her jeans again. She still hasn't realised I've been wearing her pink ones for weeks. Well, she's reading over my shoulder, so now she does! I love this style of shrug. This is the third one I've made for myself, and it won't be the last. It's McCalls 5398, which is OOP. There is enough coverage at the back and around the back of my neck to be cosy enough even in winter (given the number of layers I typically wear!) but being open in the front means that my tops or dresses (which are usually my more interesting garments. Not today obviously) are visible. Back. See what I mean about the coverage? Nice and cosy. Flat. 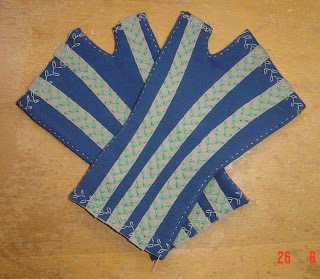 It is essentially a folded rectangle with sleeves and a band, but those diagonal seams are shoulder seams, so it has a nicer shape than a simple rectangle. The hat I'm wearing (conveniently hiding my post-run not-fit-to-be-seen hair) is what I managed to eke out of the scraps after eking the shrug out of a 0.9m remnant of merino/nylon/polyester/lycra which I picked up for a bargain $7 at the Fabric Store! (formerly Global Fabrics, for locals) This stuff is smooth and silky feeling on the outside with a really soft loopy interior. Incredibly lovely to wear. And my jeans? I nicked them from my daughter. My 13 year old daughter. (She'd gone off them and hasn't noticed I've been wearing them since I had a pair the same colour but bigger!). Yep, I'm becoming that Mum. The one who wears her daughter's clothes. Oh dear. It's my Mum's birthday next month, but she will be in England for it, specifically Devon. After which she will be in Scotland, for which these might be appropriate! These gloves (fingerless mitts from Alabama Studio Sewing and Design) are quick and easy to make, so are ideal for a gift. Meanwhile I am still working on my Poetry Tank. Here are the four sections laid out in order LF, LB, RB, RF. If you click to enlarge the pic you might see the secret word I added. One letter per panel. Or maybe this will make it show up better. Yep, pretty juvenile. 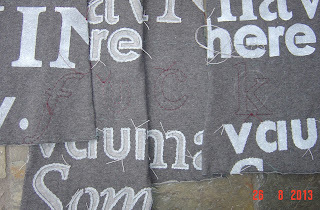 I do like a good swear at times, as anyone who knows me will attest! 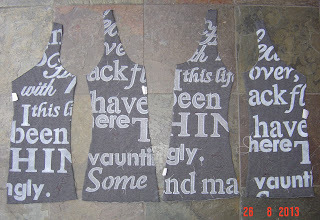 It was actually Keely's idea - she suggested breaking the word up over a seam so it wasn't obvious, and I thought if I put one letter per panel, not painted, nobody would notice (I DO NOT like swear words out there for all the world, ie children, to see) but it will make me smirk to know I am walking around saying f*** all day. Man I am way too easily amused. I should grow up and act my age. Um, this took about a month. I knew it'd be quicker than my last dress, but even so, it worked up way quicker than I expected! Based on the amount of thread used, I'm guessing 60-80 hours of work. 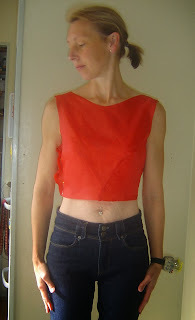 This is the Alabama Chanin corset top, and the skirt from their tank dress pattern. 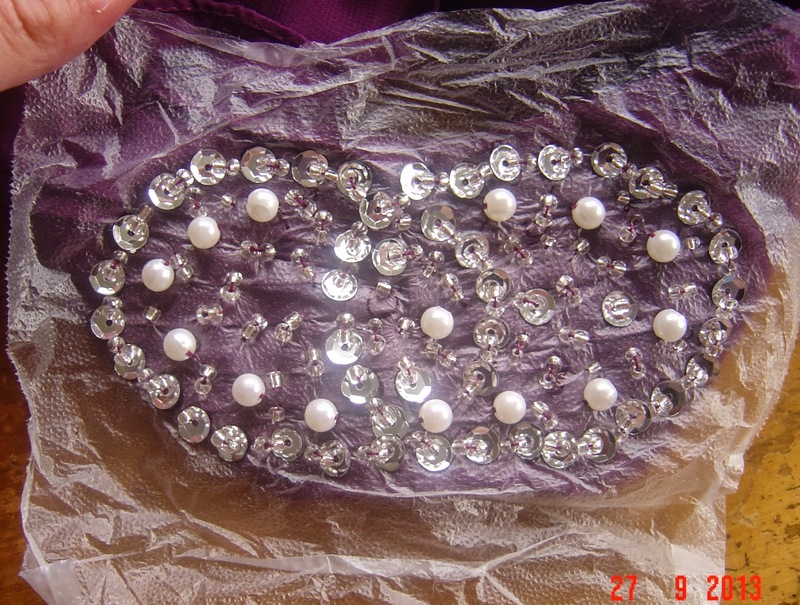 I intend that these two pieces can be worn together or separately. This is what normally happens when I try to take photos during the weekend. And because I CAN'T be without an Alabama Chanin project, and haven't found the right shade of rasberry pink for the rose dress I want to make next, I raced out this morning and bought this lot, directly inspired by the fitted top with poetry stencil shown on the Alabama Chanin Journal last week. 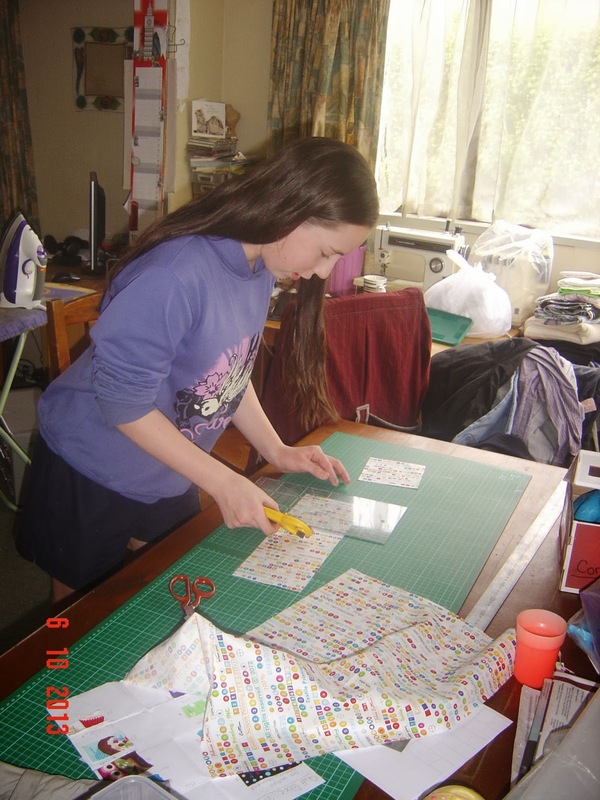 M did roll her eyes slightly when I went into her workplace to print out the stencil and get the laminator plastic to use as the stencil. Can't think why. It may be May, but it is getting COLD! According to my weather app it was 3degC this morning (that's 37.4F) Real Feel (ie, with wind chill taken into account) it was -6C. 21.2F. I am not a fan of the cold AT ALL! I prefer to wear layers of lighter weight clothes rather than a few thick or bulky layers, and I needed (as one does) some long sleeved tops which look nice, and can take a merino thermal underneath. I like a bit of interest as I often wear open cardigans. I'm really pleased with this top. I got it all done in one morning from cutting to finishing. 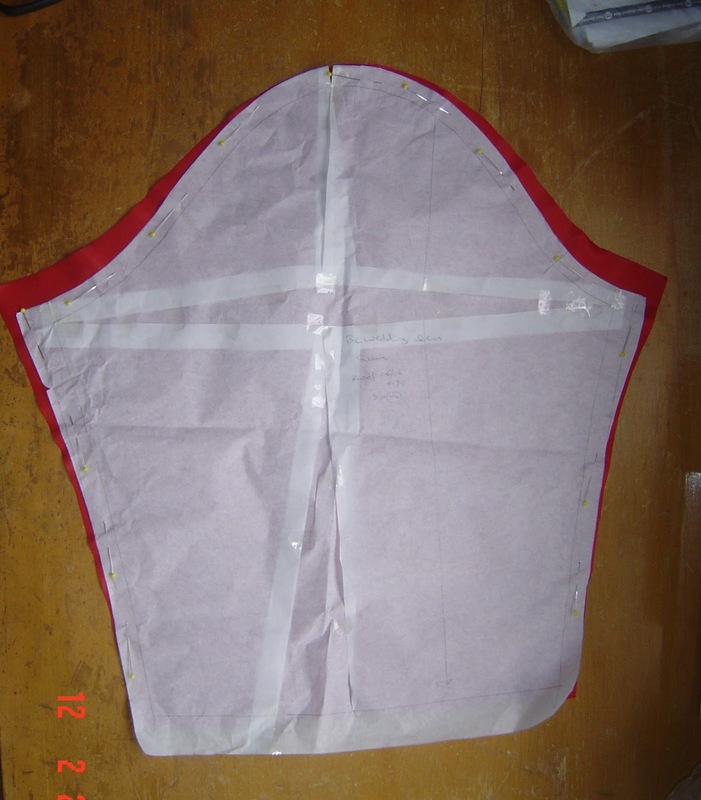 (It helped that I had the pattern traced and altered to fit already.) Although I did almost go insane trying to find a SM needle which would work - everything caused skipped stitches, one or two didn't catch a single stitch! 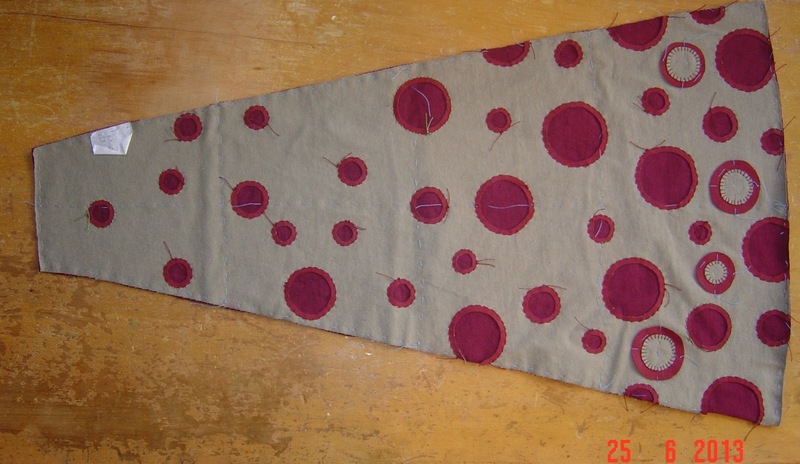 In the end a slightly used microtex size 60 worked perfectly. Which was just as well because I didn't have anything else to try in any type, size or condition. And I even managed to work out the draped bit without having to refer to my previous version, or Trudy's Youtube video. I really like the overly long sleeves, which help prevent draughts when it is FREEZING COLD walking to school. Which we started as of Friday when the twins did this. 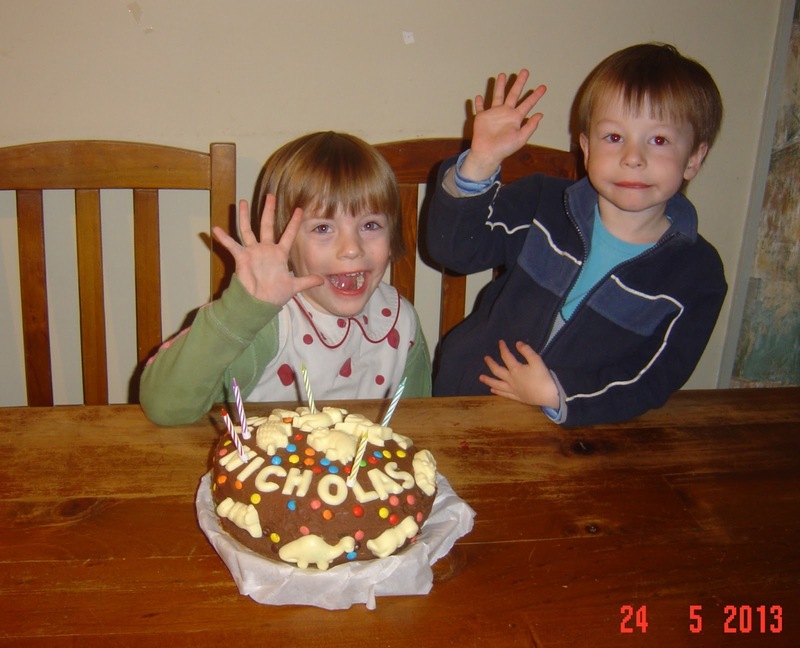 Where did that five years go? Firstly, thank you for the supportive comments on my last post - I pretty much never share my opinions on controversial subjects on the internet, since it is a terrible place to try and have a reasoned and civil debate! This was just one subject on which I wanted my support to be on the record. 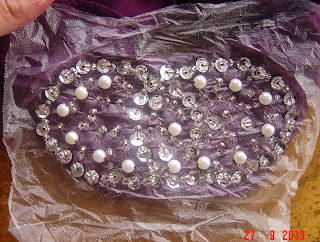 So, back to sewing. I saw this great idea on pinterest, as one does. (It comes originally from Fashion Incubator.) A spiral cut dress. What a neat idea I thought, I'd love to try that for Isabella! So I did. Starting with a size 7 block, it was pretty straightforward drafting. 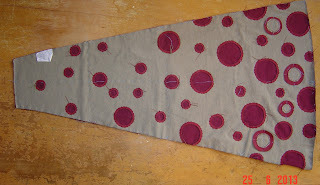 This shot gives a better idea of the shape, and shows how the panels spiral around with no side seams. I'm a bit "eh" about it, which is fine, as it was intended to be a prototype. Since I knew it would at least be wearable I finished it to be worn, and of course Isabella loves it! I am going to have another crack at the skirt portion of the draft, this time with considerably more flare - this ended up more A line than twirly. 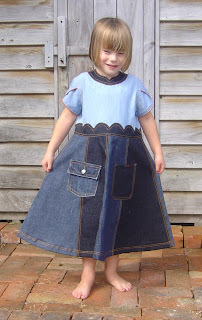 The twins turn five in a few weeks, and I'd like a better version of this to be Isabella's birthday dress. Probably pink. My girl loves her pink. There are six panels so it can be made with one, two, three or six colours! I wonder how a rainbow would look? 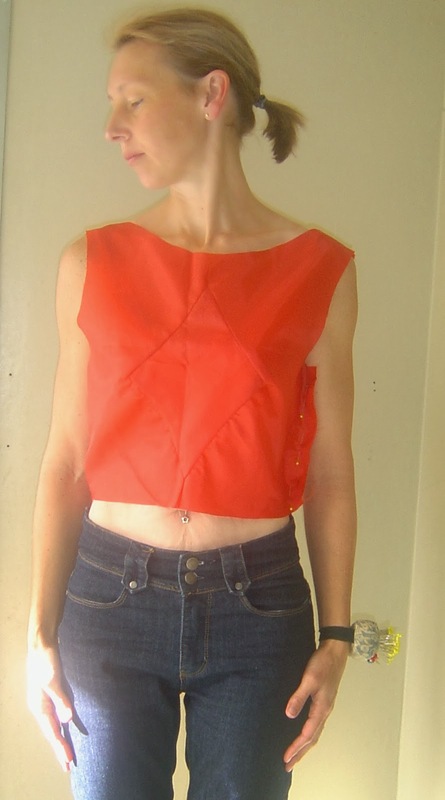 Recycling, upcycling, refashioning - call it what you will, I love turning clothes I won't wear into something that someone will wear. This dress started life as a couple of pairs of jeans and a shirt which came in a bag of hand me downs, which sadly didn't quite fit me. 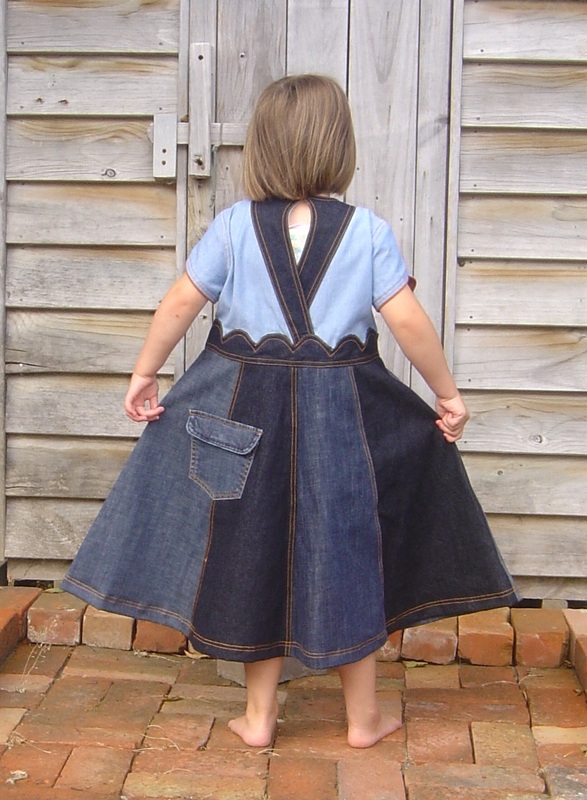 Since the jeans had wide legs I figured I'd harvest the fabric and make Isabella a dress. 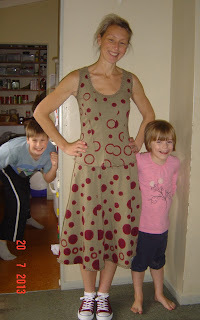 This one is based on a size 7 (Aldrich, naturally) block, so is roomy and long, but wearable. This shot shows the petal sleeve a bit better. And the back. I reused the pockets too. 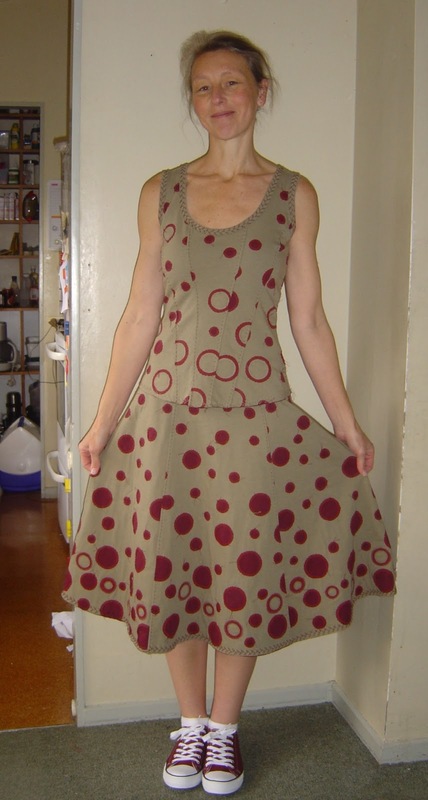 I don't like to waste the unused bits of clothes I cut up, so the leftovers of this dress (and a few other rework projects) are destined for another life as various things. I have so many pins on Pinterest of things I want to do one day. Seriously, I'll have to live to be really really really old to do everything I've ever wanted to do! And poor Isabella didn't get this dress till today because she was unable to wear dresses for a week and a half because of this. 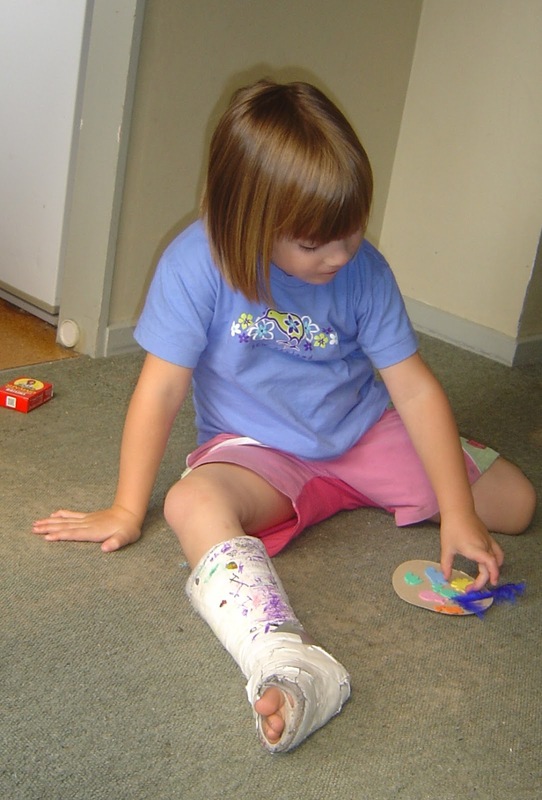 She took a tumble from a four foot tall jumping box at kindy (thanks to a shove from an impatient class mate) and landed awkwardly on her foot. An x ray showed no break, but apparently it can be hard to be sure in young children, and it was clearly badly sprained so they put this on - partly plaster, partly cotton wool and bandage. She spent 12 days crawling, riding on her three wheeler and being carried. No dress till she was walking again. The cast came off on Tuesday and she is now limping around like a champ, and delighted to get a new dress. Funny you should ask if I'm in Wellington Grace - I actually live in Dunedin (way down the east coast of the South Island), but just last week I was in Wellington, catching up with family. 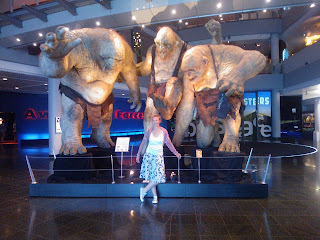 The trip included the obligatory visit to Te Papa (Museum of New Zealand), where I met these guys. Comments regarding the number of trolls in the picture invited! (J? K? M? - go on, you know you want to!) Phone pic courtesy of the sister I went with because I forgot to pack my camera. 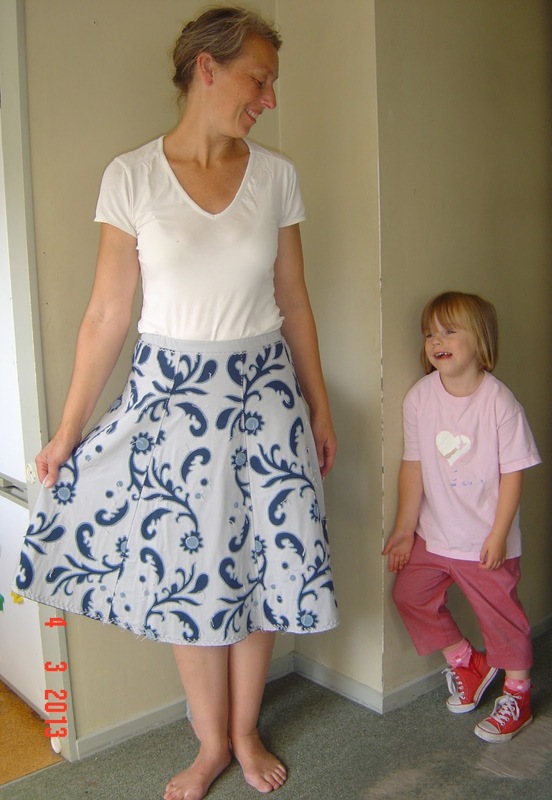 That is my Alabama Chanin skirt I'm wearing. It is really really really comfortable and I love it to bits. I think I need about twelve more, but with pockets. Instead of the foldover elastic at the waistline I added a separate casing with elastic, which I attached with a zig zag chain stitch. I was nervous that this wouldn't stretch enough to get over my hips, but it's just fine. Yay! I hate taking photos of myself, but in the interests of showing how it looks on I put it on for some shots. I wouldn't normally wear a T shirt tucked into it, and in fact I have some more of the peacock underlayer fabric and when I have time I'm going to make a plain corset top to wear with it. Both twins got in this pic with me. Can you spot Nicholas? To close, I put myself on the Sewintists map. Where I am currently the most southerly pin in the whole world. There has GOT to be someone south of me who sews! I needed a new lightweight coat. I'm going to Wellington for a few days with one of my sisters next month to visit family. (That reunion at Christmas has sparked a few more!) 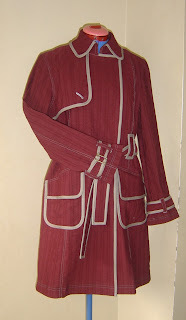 My other light coats are getting a bit tired, and while still serviceable, not nice enough for a trip away - you know how it is! In the interest of having as much spending money as possible while away (ie, some) I figured I'd see what I could do using only stuff I had on hand. As it turned out, without buying a single thing, I could do this. Here's the inside. I like the tiny partial lining. So I ended up with this, and a massive dose of frustration. 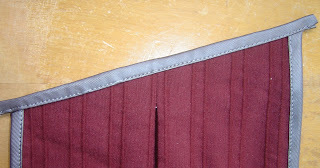 The fabric I ended up choosing for binding is a regular woven, and behaved perfectly. I'd still like to have had that silver though. 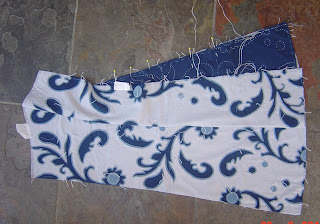 Meanwhile my Alabama Chanin skirt is now being seamed! All six panels have been stitched and snipped and I just have to join them together, add a waistband and rosebud stitch the hem. Just in time for my trip. And because I MUST have the next Alabama Chanin project lined up for when one is finished, I have stenciled the pieces for another tank dress. This is the Abbie's Flower stencil, fattened up a bit. 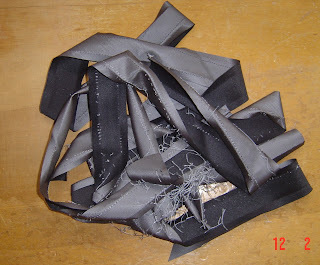 Um, yeah, stitching these is going to take a while. 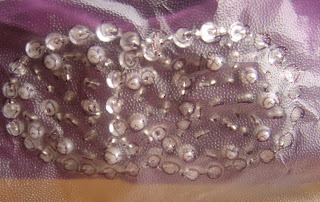 I'm not snipping out the interior of the shapes, or beading on this dress, so it'll be a bit more wearable for every day. 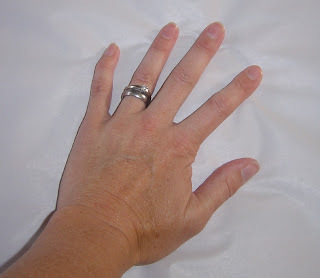 OK girls, can we all guess what project is coming to every craft night for the next year? My lovely 83 year old bride-to-be brought me a skirt which she likes to copy for her wedding outfit. 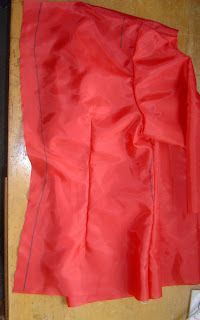 It is one of the simplest garments to copy, being a simple six gore skirt - no darts, no gathers, no intricate details. Here's how I like to do it. Firstly I had to have an appropriate surface. I need to poke pins through the garment into paper, so it has to be padded, but not so soft that I can't hold down garment sections with my hand without distortion. Like this. This is a blanket folded in four, and when I press down the paper distorts, which would make an accurate copy harder to achieve. This is the blanket folded in two. 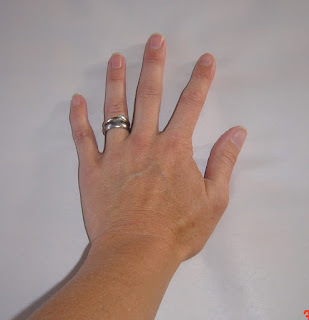 When I press down on the paper there is very little distortion. A carpeted floor is also good, but hard on the back to be hunched over! 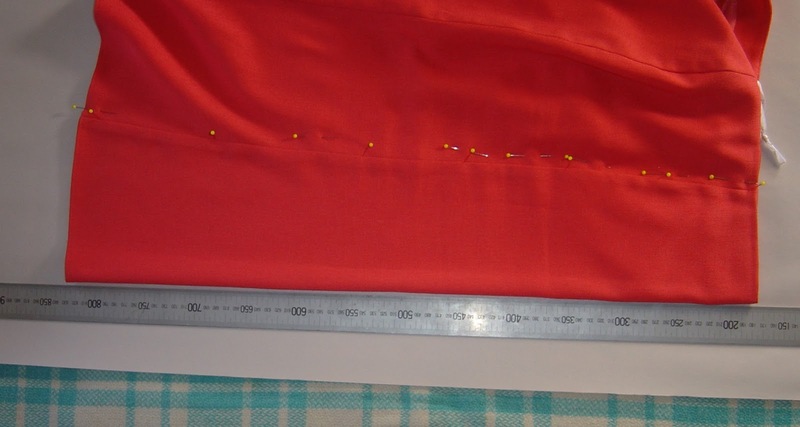 To copy each section I placed pins vertically through the piece to be copied to hold it in place, then used another pin to poke through at intervals all along the seam lines all around the piece. 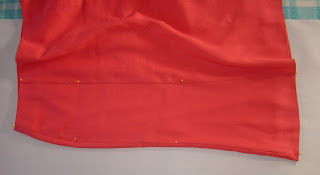 I couldn't get a photo of the the pricked holes unfortunately, but basically after pricking off the piece you connect the dots to reproduce your garment section. 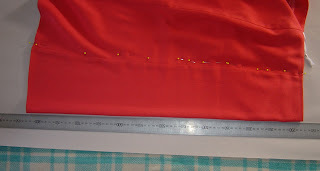 To copy the centre front I aligned and pinned the seam lines and lined up the CF along a ruler before following the same process. After adding nice wide seam allowances, the pattern is ready to go. The first fitting showed the skirt needed minor alterations at the waist, and the top a couple of tweaks, which show up nicely when drawn onto my toile with a sharpie. The shoulders are too wide, the waist needs to come in a little, and the CB seam needs to be slightly more contoured. The sleeve didn't hang well when moved into place, so for our second fitting I modified it to raise the sleeve cap and narrow the sleeve. This is the altered pattern on top of the original sleeve. 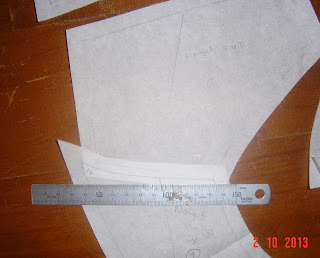 (The diagonal overlap is where I joined two pieces of paper to make the original sleeve pattern. Ignore it). The pattern has been slashed vertically and horizontally, with the vertical slash overlapping, and the horizontal one spread. At our second fitting this was a big improvement, but I'm going to do the same thing again to get a bit more height and a bit less width. 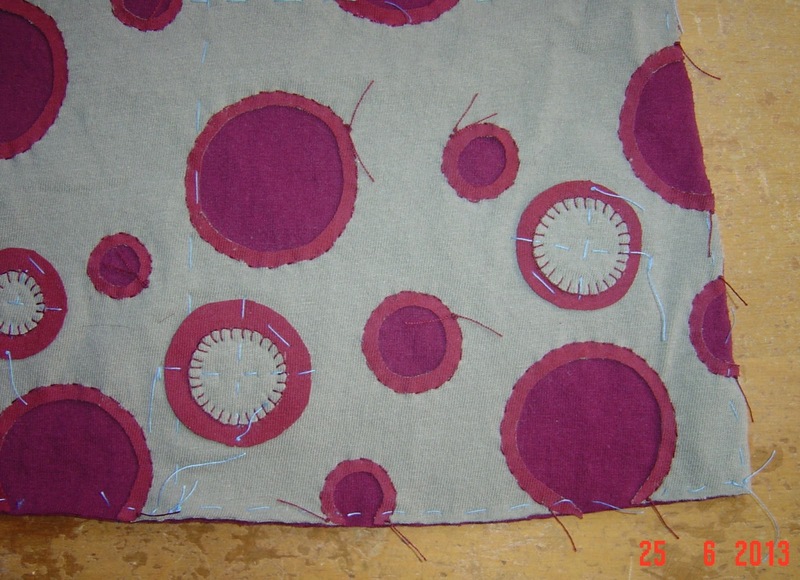 And for myself I've started working on a trench jacket. Progress post on that to follow!